This is a waterline 1/700 scale resin kit by Combrig Models . 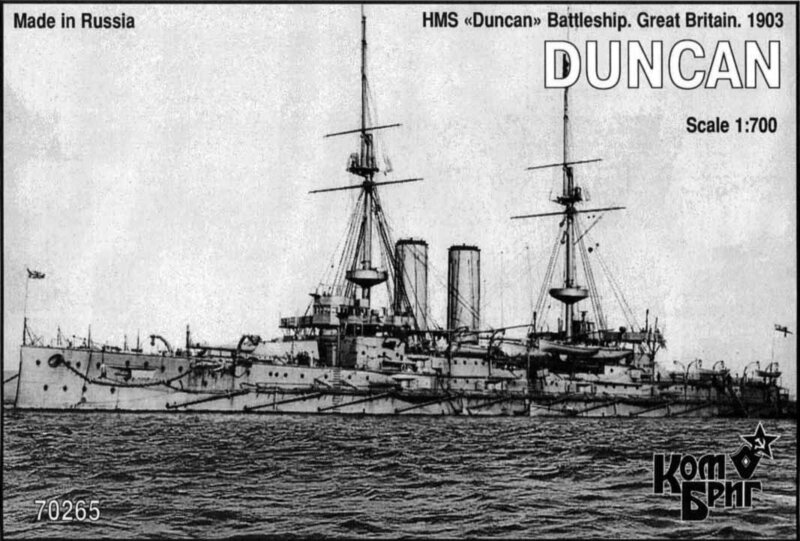 HMS Duncan commissioned at Chatham Dockyard on 8 October 1903 for Mediterranean Fleet service. She transferred to the Channel Fleet in February 1905. On 26 September 1905, she collided with battleship HMS Albion at Lerwick, suffering hull damage including a hole in her side below the waterline, rudder damage, and the loss of her sternwalk. She suffered another mishap on 23 July 1906, when she grounded off Lundy Island during unsuccessful operations to salvage battleship HMSMontagu. Duncan transferred to the Atlantic Fleet in February 1907, and underwent a refit at Gibraltar from November 1907 to February 1908. On 1 December 1908, Duncantransferred to the Mediterranean Fleet to serve as Second Flagship. She underwent a refit at Malta in 1909. Under a fleet reirganization on 1 May 1912, the Mediterranean Fleet became the 4th Battle Squadron, Home Fleet, and changed its base from Malta to Gibraltar; Duncan thus became a unit of the squadron at Gibraltar. On 27 May 1913, Duncan recommissioned at Chatham with a nucleus crew and was assigned to the 6th Battle Squadron in the Second Fleet at Portsmouth, where she served as a gunnery training ship in the commissioned reserve. She began a refit at Chatham in May 1914. Duncan was sill undergoing her refit when World War I began in August 1914. Plans originally called for Duncan and battleships Agamemnon, Albemarle, Cornwallis,Exmouth, Russell, and Vengeance to form the 6th Battle Squadron in wartime and serve in the Channel Fleet, where the squadron was to patrol the English Channel and cover the movement of the British Expeditionary Force to France. However, plans also existed for the 6th Battle Squadron to be assigned to the Grand Fleet, and, when the war began, the Commander-in-Chief, Grand Fleet, Admiral Sir John Jellicoe, requested that Duncan and her four surviving sister ships of the Duncanclass (Albemarle, Cornwallis, Exmouth, and Russell) be assigned to the 3rd Battle Squadron in the Grand Fleet for patrol duties to make up for the Grand Fleet's shortage of cruisers. Accordingly, the 6th Battle Squadron was abolished temporarily, and, upon completion of her refit in September 1914, Duncan joined the 3rd Battle Squadron at Scapa Flow, where she joined the Grand Fleet's cruisers on duty in the Northern Patrol. Duncan and her four Duncan-class sisters, as well as the battleships of the King Edward VII class, temporarily were transferred to the Channel Fleet on 2 November 1914 to reinforce that fleet in the face of German Navy activity in the Channel Fleet's area. On 13 November 1914, the King Edward VII class ships returned to the Grand Fleet, but Duncan and her sister ships stayed in the Channel Fleet, where they reconstituted the 6th Battle Squadron on 14 November 1914. This squadron was given a mission of bombarding German submarine bases on the coast of Belgium, and was based at Portland, although it transferred to Dover immediately on 14 November 1914. However, due a lack of antisubmarine defenses at Dover, the squadron returned to Portland on 19 November 1914. The 6th Battle Squadron returned to Dover in December 1914, then transferred to Sheerness on 30 December 1914 to relieve the 5th Battle Squadron there in guarding against a German invasion of the United Kingdom. Between January and May 1915, the 6th Battle Squadron was dispersed. Duncan left the squadron in February 1915 to be reduced to reserve for a refit at Chatham that lasted until July 1915. She recommissioned at Chatham on 19 July 1915 and was attached to the 9th Cruiser Squadron on the Finisterre-Azores-Madeira Station. In August 1915, Duncan transferred to the 2nd Detached Squadron in the Adriatic Sea. The squadron had been organized in May 1915 to reinforce the Italian Navy against the Austro-Hungarian Navy after Italy declared war on Austria-Hungary. Duncan was based at Taranto, Italy, during this service. In June 1916, Duncan transferred to the 3rd Detached Squadron in the Aegean Sea, based at Salonika. From October to December 1916, she participated in operations against Greek royalists, and landed Royal Marines at Athens on 1 December 1916. She returned to the Adriatic Squadron in January 1917. In February 1917, Duncan returned to the United Kingdom and paid off at Sheerness to provide crews for antisubmarine vessels. She was in reserve at Sheerness until April 1917, when she moved to Chatham for a refit. Upon completion of her refit in January 1918, she remained in reserve at Chatham, serving as an accommodation ship. Duncan was placed on the disposal list in March 1919, and was sold for scrapping to Stanlee Shipbreaking Company Limited, Dover, on 18 February 1920. She was towed to Dover for scrapping in June 1920.